The Circle is about a woman, Mae, who goes to work for a company called The Circle. It’s what Google would be if it combined with Facebook and then everyone was eager to share everything about their worlds online. The founder of the company just wanted to solve problems; one CEO they brought in was very shark-like in exploiting everything for profit; another genuinely believes that if you share everything, the world will be a better place. Mae drinks the kool-aid. She starts broadcasting everything about her life. As you might expect, it doesn’t all go well. The Circle isn’t realistic, in the same way that 1984 isn’t realistic. Nineteen Eighty Four is a more effective dystopia – the horror of the all-seeing state is visceral in 1984. 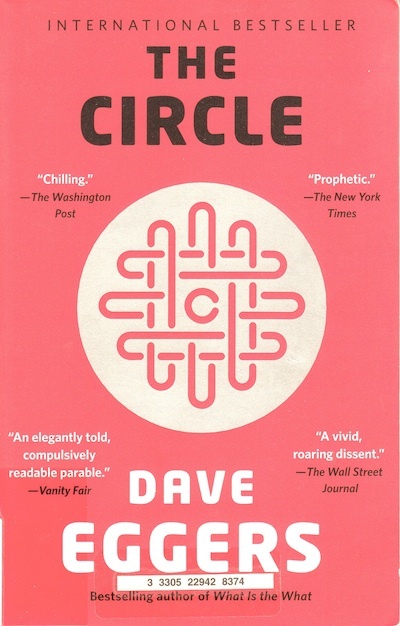 The all-seeing company of The Circle is equally horrifying by the end, but the book eases Mae into the company (and the reader, as the book is told from her point of view) and so you can kind of see where the company is coming from. It doesn’t make it better, mind you. My main quibble is that the Mae portrayed at the beginning of the book wouldn’t simply be eased along the path. She would rebel at some of the more outlandish things along the way. The book isn’t great, but it did make me think about social networking, narrative structure, and characters – is it realistic that Mae is so needy that she makes the decisions she does? To that end: good job, book.